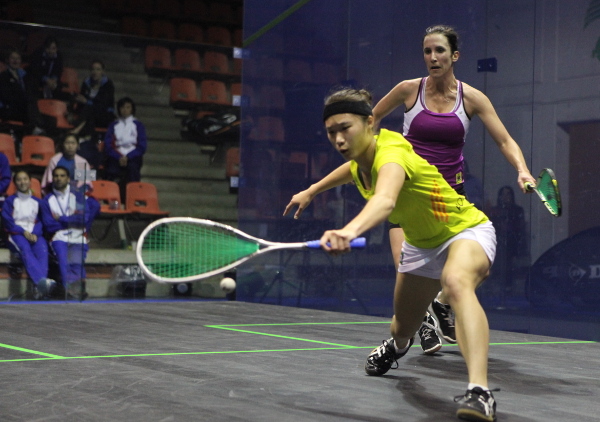 Two points away from a shock defeat in today’s WSF Women’s World Team Championship last 16 round in Nimes, second string Joey Chan reeled off six points in a row to steer fourth seeds Hong Kong to a 2-1 win over South Africa, the 14th seeds, and into the quarter-finals of the World Squash Federation event being staged in France for the first time. The championship boasts a record entry of 26 nations and is being staged simultaneously at both the eight-court Club des Costières and La Parnasse Arena where, for the first time ever, action is taking place simultaneously on three all-glass show courts. With only two world-ranked players in their squad – one outside the top 100 – South Africa could have been thought to be straightforward opponents for Hong Kong, the young side seeded to make the semi-finals with four players inside the world top 60. But Milnay Louw, a 24-year-old from Cape Town ranked 118 in the world, immediately startled the Hong Kong camp by defeating Liu Tsz-Ling, ranked more than 80 places higher, 12-10, 12-10, 11-5 in 31 minutes. Shortly afterwards, the experienced Annie Au, the world No.9 with 10 Tour titles to her name, found herself two games down to the South African number one Siyoli Waters, a Cape Town 29-year-old ranked 47 in the world. But left-hander Au dug deep to win 11-13, 7-11, 11-6, 11-9, 11-3 and leave matters in the hands of her 24-year-old team-mate Joey Chan, the world No18. But unranked Diana Haynes had clearly not read the script. The 30-year-old from Johannesburg led 2-1 in games, then reached 9-5 in the decider, just two points away from victory. Spurred on by her vociferous compatriots, Chan cut away the deficit until reaching match-ball at 10-9, which she duly converted to record a dramatic 11-6, 6-11, 8-11, 11-8, 11-9 win. “It was bad enough when we dropped the first match, but when Annie then went 2-0 down, I thought ‘we’re finished’,” admitted Hong Kong coach Faheem Khan. “After Annie won, I thought we’d be fine, but Diana was really handy and pushed Joey at the front of the court. “South Africa played really well – and I must say that I think we were lucky to get through,” added the former world No.22. Au admitted that their opponents put them under pressure: “They had a lot of confidence and had nothing to lose. They were very good. The top three seeds had little trouble securing their places in the last eight. Third seeds Malaysia, led by world number one Nicol David, beat Czech Republic, the 13th seeds 2-0, and second seeds Egypt despatched Mexico over three games lasting less than an hour of playing time. In the final tie of the day, favourites England crushed British neighbours Wales. Yet to drop a game in the championship, England’s Sarah Kippax, Laura Massaro and Alison Waters extended the record and can now look forward to meeting Ireland for a place in the semi-finals. In the play-offs for places 17-26, event first-timers Republic of Korea celebrated their first wins in the tournament by beating Austria 2-1 and China 3-0, thereby making certain of a final placing within the top 19.